Rise of biometrics across the globe during the last decade has been astonishing. It has not only made to the mainstream identification practices, but has completely replaced traditional methods of identification in some areas. Governments in many countries have adopted this technology to secure borders, identify citizens and maintain law and order, while private organizations are leveraging it to safeguard their physical and virtual resources, access control, employee attendance and basically wherever it is possible to deploy it. These days, even budget smartphones are offering fingerprint sensors that can not only be used for unlocking phone but also authenticating payments and perform online transaction. Various service providers are looking to leverage this tiny piece of hardware for customer identity authentication. Many Banking and finance companies have already integrated their services to take advantage of fingerprint authentication on smartphones. Though biometrics has made a swift progress in terms of technology and adoption rate, there is still a long way to go. Recognition systems have their limitation and there are still shortcomings that need to be fixed. Research is continuously underway to address inadequacies in current biometric recognition systems. On the other hand, the hardware is getting cheaper due to growing adoption rate and economy of scale. Both of these factors are going to affect growth of biometric systems positively. As biometric systems improve, the adoption rate grows, and as the adoption rate grows, biometric hardware is set to become further inexpensive due to economy of scale. Deployment of fingerprint recognition systems has particularly seen growth due to implementation at workplaces, banking, retail, and financial services. Fingerprint biometrics making its way to mobile devices has also helped increase user awareness, helping it pose as fast and user friendly technology. Being inexpensive and easy to deploy, fingerprint recognition systems has grabbed the most attention among all biometric methods of recognition. 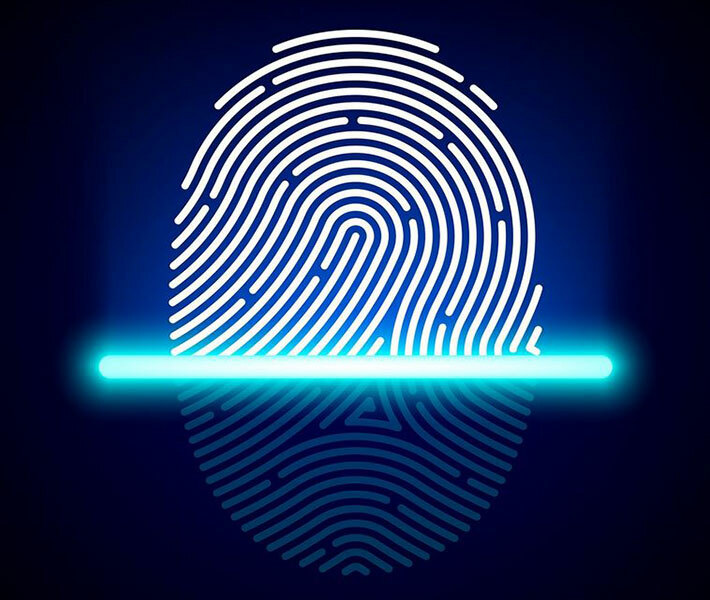 Having its roots in forensic applications and with a history of more than 100 years, fingerprint recognition is the most developed, deployed and user friendly recognition method among biometric recognition applications. There is a vast range of fingerprint scanners available in the market. They come in different sizes, shapes, equipped with different sensor types and technology. Some fingerprint recognition systems can work without the need of any external assistance, for example fingerprint scanners used for access control or employee attendance, usually come with ability to enroll, verify and store data independently, if you want to export this data to an external device, that is when you need a PC, smartphone or a storage media. There are also tiny fingerprint scanners available in the market, which cannot perform any operation without being connected to a computer or a smartphone. The PC or the smartphone have the designated application that processes sample data captured by the scanner, scanner itself has no processing capability. Price of Fingerprint scanners vary greatly depending on factors like brand, waterproofing, certifications, type of sensor, etc. A small USB fingerprint scanner can cost as little as $50 and a sophisticated ten finger scanner with live finger detection ability can cost up to $2500 as well. The data capture sub-system is an important part of a fingerprint recognition system that samples biometric data for further processing. All other systems depend on the data capture sub-system. Fingerprint sensor is an important part of a biometric data capture sub-system that contributes towards the performance of the overall system. Performance of a biometric system does not solely depend on recognition algorithm; image quality also plays an important role in recognition performance. Recognition algorithm only makes use of what is presented to it, i.e. the scanned image of biometric characteristics. Poor quality fingerprint image will make it hard for recognition algorithm to identify and calculate available minutia that will affect overall performance of a biometric system. The technology used in constructing the fingerprint sensor affects how sensors capture the fingerprint image. Image word has mostly been associated with photography so capturing the fingerprint image with the help of visible light seems a viable solution, however, the ground reality is different. The recognition system requires details of friction ridges like where a ride ends or bifurcates. Capturing these details require a good sensing method including but not limited to light. Ultra sonic sound waves, heat, capacitance, etc. are other means that can help capture details of fingerprint surface. Fingerprint sensors constructed using any of these methods are known by the method itself, for example, capacitive fingerprint sensor, ultrasonic fingerprint sensor, optical fingerprint sensor, etc. Optical and capacitive fingerprint sensors are used prominently across many devices and applications. Optical sensing is the earliest method used for capturing fingerprint features. Optical fingerprint sensors make use of an image sensor to capture image of the fingertip surface. The basic configuration of capturing fingerprint image by an optical sensor is more or less same as a digital photography camera. This captured image is then post-processed to enhance quality and make it usable for fingerprint recognition algorithm. 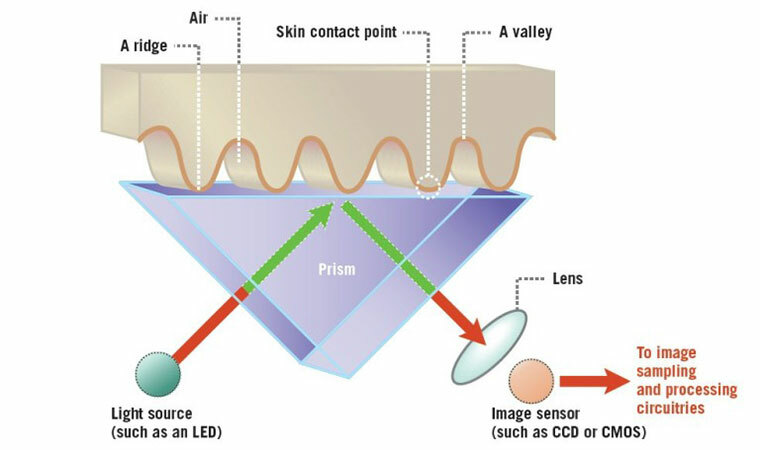 Optical sensors have high resolution image sensor to capture as much details as possible. The higher the resolution, the finer details the sensor can discern about your finger, increasing the level of security. Optical sensors have inbuilt light source to illuminate fingertip surface as external lighting cannot be of much help when fingertip is placed on the scanning surface. Source of light is mostly LEDs to keep the power consumption low. The positive side of optical sensors is that they are cheap and found mostly on inexpensive biometric devices, however, they are comparatively easy to spoof as they only make use of a two dimensional fingerprint image. There are optical fingerprint sensors that come with liveness detections as well, to safeguard from spoofing. Capacitive scanners make use of pixel array of capacitors instead of visible light, to produce the image of fingerprints. An array of tiny capacitors is placed just below the scanning surface to collect fingerprint details. When fingertip touches the scanning surface, charge of capacitors changes which are located just below the friction ridges. This difference of charge beneath the friction ridges and valleys is tracked by an op-amp integrator circuit, which can then be recorded by an analogue-to-digital converter. This data is used to map unique fingerprint characteristics and stored by the system to make a comparison later. Resolution ability of capacitive sensors depends on the number of capacitors used in the pixel array. With larger number of capacitors, capacitive sensors can resolve more details of fingerprint features, enhancing performance of the recognition system. Capacitive sensors can be made highly compact and are widely used on mobile and portable devices. They offer better security as they are hard to spoof. Capacitive scanners do not capture fingerprint features optically, so they cannot be fooled with fingerprint images or prosthetics. On the other hand, they are little more expensive than optical sensors. Understanding different sensor types, their benefits and drawbacks can be crucial for selecting a biometric system that serves your purpose. While recognition systems with optical sensors may look tempting due to low price, meagre spoofing resistance will be a deal breaker for high security applications. On the other hand, performance and security of capacitive scanners will come at a price. There are factors depending on scanner types and fingertip surface quality that may require multiple attempts to scan a finger, for example: dirty fingers can take time to scan on an optical sensor, on the other hand, clean but wet fingers may require multiple attempts to be scanned on a capacitive scanner. Worn off fingerprints may also require multiple attempts to be captured. Capacitive sensors are marking their presence on more and more mobile devices while applications of optical sensors have shrunken to office attendance, low security door access, etc. Choosing a right sensor type is often a trade-off between price and security.